Custom designed resistive load banks allow for load simulation of many electrical applications for testing purposes. When an electric motor driven load is being decelerated, the motor acts as a generator, converting kinetic energy of the load to electrical energy. The dynamic braking circuit converts this electrical energy into heat to slow the load, through the use of dynamic braking resistors. 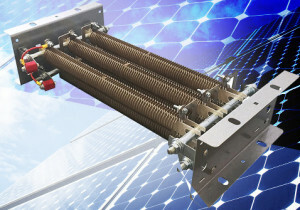 Braking resistors ensure proper motor operation, allow heavy loads to stop quickly and protect the drive from damage. Furthermore, dynamic braking resistors that are improperly cooled, incorrectly sized, physically damaged or electrically failed can cause costly unwanted down time. The new GREM resistors feature a resistance range from 0.067 Ω to 24.273 Ω (no typo), with a tolerance of ± 10%, temperature coefficients down ±130 ppm/°C, and currents from 18 A to 345 A. The devices offer high temperature operation to +415 °C. The datasheet is here.